It’s not easy being green! Unless you’re one of the eco-conscious locations in the Hershey Harrisburg Region. Visit natural havens perfect for putting your phone down and getting lost among the trees. There’s no likes or retweets on these trails. Just serene environments filled with lush landscapes and great animal watching. You don’t have to be an environmental activist to make a difference. Simply make the effort to support conservation efforts on your next getaway. So, go on and go green with an earth-friendly experience. Tucked against the urban backdrop of Harrisburg is the natural oasis Wildwood Park. 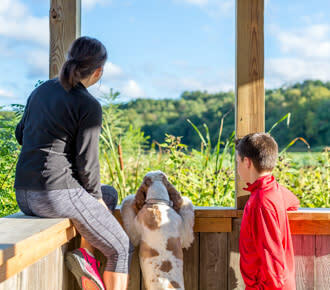 The park is a 90-acre wetland marsh is dedicated to preserving the land it sits on and the animals that inhabit it. 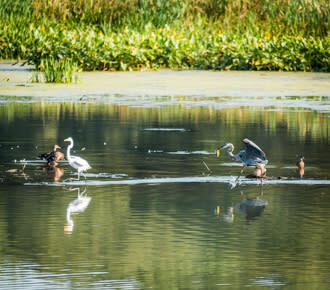 Endangered flora and fauna like the American lotus, great egret, black-crowned night-heron, and yellow-crowned night-heron are found on the lake. 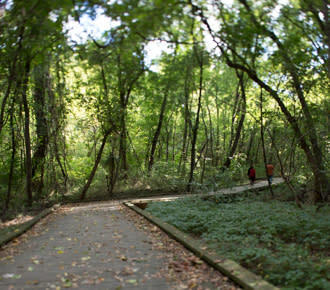 Explore the wonderful walking trails to catch glimpses of sycamores, songbirds, and squirrels. 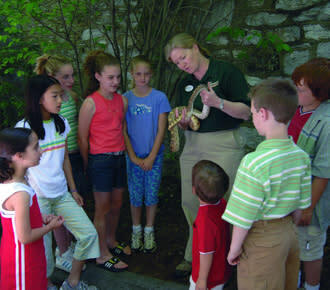 Families flock to the Benjamin Olewine III Nature Center to get an educated perspective through interactive exhibits. Be sure to visit Art in the Wild, an outdoor art exhibit along the trails of the park. 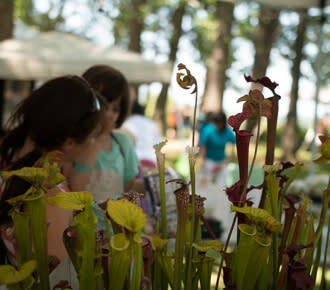 Monthly events include walks focused on stress relief, flower education, and songbird spotting. Check their website for more events happening during your stay. 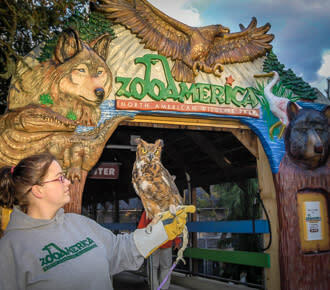 At ZooAmerica®, you can walk through the natural splendor of North America by geographic region. While wandering the trails, you’ll see a lynx in the Northlands, elk in Big Sky Country, and alligators in the Southern Swamps. 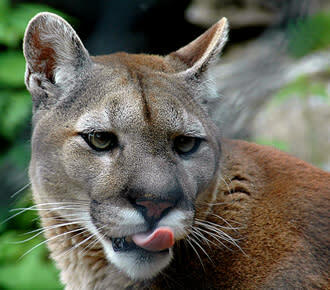 Animal caretaking at the wildlife park extends into conservation efforts for endangered and declining species. Since 2011, ZooAmerica® has been the reintroducting of the regal fritillary butterfly. Behind the scenes of the zoo, staff are busy breeding butterflies, collecting eggs, and releasing more than 1700 caterpillars each year to designated sites. One of those sites is at Fort Indiantown Gap, where you can see the regal fritillary in its natural habitat. 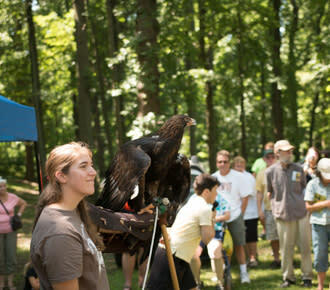 Other animal conservation efforts revolve around American kestrels, peregrine falcons, and thick-billed parrots. A trip to Hershey isn’t complete without a visit to ZooAmerica® (and of course, a little chocolate). Acclaimed artist Ned Smith was known for his astonishingly accurate portrayals of wildlife through drawings and paintings. 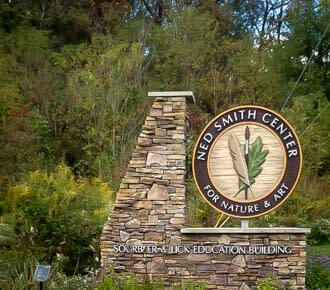 In honor of his work and passion for the nature that inspired him, The Ned Smith Center for Nature and Art opened its permanent home in 2004. Nestled in the rolling hills of his hometown, Millersburg, the center boasts a large collection of original Smith works, as well as a rotating collection of local artists in the gallery. Outside of the gallery, the landscape is beautiful and serene. You’ll feel as though you have stepped into one of Smith’s paintings as you wander the variety of trails scattered across the property. Remember: you don’t have to plant a tree or start a recycling drive to help the planet. Instead, invest part of your getaway in the places that care for mother nature all year round. Start planning your green getaway now!